People are creatures of habit. They hate making changes. If they have a problem, they quickly get used to it and come up with the solution they need to keep going. Despite this, more companies switch to M-Files every day. Why? Because it is the best ECM tool on the market. But don’t just take our word for it. Is Your Document Management Process Losing You Money? If you are like most businesses, you lose, on average, 2-4 hours a week rounding up everything you need. You don’t want to lose time searching for the documents you need, but you don’t have a choice. Your ECM software solution doesn’t match your needs. Are you tired of traditional content management solutions slowing down your business? 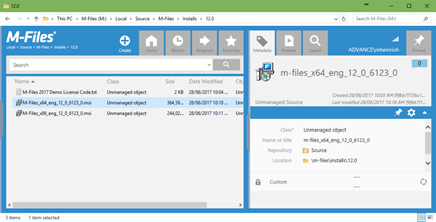 This is the latest enhancement from M-Files where it doesn’t matter where a document is stored or what system manages it, M-Files will provide easy access to it through their user interfaces and allow metadata to be edited and added. This is done with the aid of intelligence services that add a layer of artificial intelligence to M-Files. Allows end users to use any M-Files interface to search, browse, edit, and add metadata to content located in repositories other than vaults by means of special vault applications known as connectors. Within the industry, it is known that when an organisation fails to research their needs for an ECM system that there is a good chance that the project will fail, or the resulting implementation will leave a lot to be desired. Therefore, the most cost-effective step you can take when purchasing and implementing an ECM system is to not rush through the process of choosing your supplier. This is assuming that you have identified a need for an ECM system in the first place, and that your employees are invested in an ECM solution. It is imperative to start with finding out what your needs are, and how they will be addressed by your potential ECM solutions. You must gather feedback from all areas of the business who will be using the system. As ECM is a huge product category, and ECM suppliers provide a very wide variety of products and product features, it is vital to define and understand what functionality is required before moving further. What type of training and support do they provide? What technology platform do they use and how scalable is it? What do they know about your industry and potential problems within that industry? Do they have success stories and testimonials from other clients? It is important that after installation and configuration, that post implementation support is available, and you know the cost for that support. Ensure that you feel comfortable with the technical staff who will be providing that support. Many ECM systems can be run on-premise or in the cloud, with different methods of accessing each. In the future you may need to setup users with different configurations, to adjust to the needs of your business. This includes flexible licensing options, which may allow for greater customisation in the long run. It is important to ensure that your solution can be integrated with any third-party apps or data that you currently use. Miss out on this step and you may end up having to take more steps to accommodate for those apps, resulting in more work for users. When choosing an Enterprise Content Management solution, ensure that you cover all the above points. There are other things to consider of course – as each organisation has different needs. Choosing a solution that doesn’t meet the needs of your organisation could be costly, so invest time and money in clearly defining your needs and selecting suitable partners. To learn more about Electronic Content Management, don't hesitate to speak to one of our team members by contacting us below. M-File’s next release will include some powerful artificial intelligence services to help end users with metadata suggestions. I mentioned in another article that the power behind IML’s ‘Intelligence Components’ comes from the integration of Abbyy’s Artificial Intelligence (AI) technologies into M-Files. Based on textual content capture and OCR these AI technologies interpret text using algorithms that analyse the meaning of the words and the relationships between them allowing real time classification of complex and unstructured data. Even though it sounds complex, it couldn’t be simpler for the end user. Drag a document into the vault and you’re presented with ‘tags’ or ‘suggestions’ that you can click on to populate the metadata fields. The ‘tags’ are based on information in the document that matches metadata already in the vault. For example, your vault may have a list of suppliers stored as metadata to use when adding invoices. When AI reads the invoice, because it matches the supplier name with the one stored as metadata in your vault, a tag is created as a suggestion for you. All you need to do is click on it to add it as metadata, much faster, easier and more accurate than clicking in the field and typing the name to select it. It doesn’t stop there either; AI based metadata tags can be invoked on existing documents when a property is changed. This is especially useful for business processes where metadata is added or changed along the way in a workflow. Going back to our invoice example, the initial metadata suggested when added didn’t include a description as this is to be populated by the person approving it. If you want to know more about how to setup M-Files Intelligence Service to make suggestions when adding documents or when a property is changed, please contact us. On a recent trip to California I discovered how convenient instant access to information from Google Assistant on my Pixel phone was to help make decisions in a place I was completely unfamiliar with. While navigating to the next stop I could ask for ‘places to eat’, ‘gas stations’ or ‘tourist stops’ and have suggestions, from data scattered all over the web, presented in real-time in Google Maps. Imagine if your ECM could do the same and present information and search results from all the different systems and repositories in your organisation in one simple familiar interface. For this to work the ECM would need a common interface that connects to your CRM , Accounting System, shared network drives, file syncing services like Dropbox and OneDrive, e-mails and SharePoint as well as some way of reading all the content in those repositories and intelligently storing metadata to allow you to search on it. Combine the ability to add your own metadata to those items while preserving the content from its original repository so it doesn’t stop its use in the original system and you would have a very user friendly, ‘Repository Neutral ECM’ where the context is more important than where something is stored. The ‘Unified User Experience Layer’ is the ‘simple user interface’ that provides a single familiar user interface to interact with information regardless of the original repository. Think of it as Google Maps. This includes simple user access from any device including mobile apps for phones and tablets in addition to PCs. Just like Google Assistant’s ability to present outside information in Google Maps by simply asking, having a simple user interface means the user doesn’t need to learn other systems to be able to find relevant content in them and they can add their own metadata without stopping it from continuing to be used in the original system. The ‘Multi—Repository Backend’ connects with the organisations repositories and systems via ‘connectors’ that include a set of core ‘out of the box’ connectors for repositories like network file shares, Office 365 and SharePoint, but also allow third-parties to develop connectors for other repositories and systems. This allows organisations to preserve legacy systems and avoid expensive integrations or migrations to new systems just to add functionality. 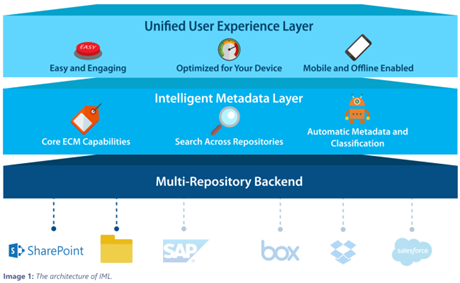 The ‘Intelligent Metadata Layer’ (IML) contains the intelligence components and multi-repository search along with the typical capabilities of an ECM such as search, dynamic views, workflow, security, version control and check-in/check-out. The intelligence components support automatic classification and metadata suggestions using text analytics. Like the Multi-Repository connectors, third-parties can add ‘metadata providers’ for specific industries or use cases. Along with text analytics, this layer includes machine learning to help improve suggestions based on user behaviour. The power behind IML’s ‘Intelligence Components’ comes from the integration of Artificial Intelligence (AI) from Abbyy into M-Files. Abbyy produces Artificial Intelligence technologies based on textual content capture and OCR. This AI technology allows text to be understood and interpreted based on its content using algorithms that analyse the meaning of the words and the relationships between them. This allows accurate classification of complex and unstructured data in real time. It’s exciting to see this automatic classification and metadata tagging in action, drag and drop a document into M-Files and you’re presented with ‘tags’ or ‘suggestions’ that you can click on to populate the metadata fields. Similar to how Google Assistant effortlessly presents pins on Google Maps of suggestions from your request on ‘places to eat on my route’. The ‘tags’ are based on the content of the document being passed through the Intelligence Services in IML and returning matches. If you don’t like the suggestion you can still select metadata as you would in the past and the AI learns from your behaviour. This technology will improve the efficiency and accuracy of data typically entered by humans as the suggestions help you make the right selection. The benefits of IML don’t stop at metadata suggestions, there’s also the External Connectors to other repositories. We’ve all used Windows folder search and most likely found it painful at the best of times, especially if it’s a network share. This is where IML’s External Connectors can help, because the content is indexed by the ‘Connector’ you can use M-Files powerful search feature to quickly locate a file based on its content rather than where you think it might be stored. It’s lightning fast and allows you to add your own metadata to any object from any repository to help you manage your information better. Having a connector for every repository in your organisation is a powerful concept that is difficult to ignore. The Intelligent Metadata Layer allows organisations to have a true Repository Neutral ECM by providing Intelligent Services and External Connectors that present information from all the different systems and repositories in a single simple to use interface. It allows them to keep their legacy systems and avoid expensive integrations and migrations while providing simple efficient access. If you’d like to find out more on M-Files and how the Intelligent Metadata Layer can help your organisation, please contact us. Read my blog on 5 Things to Consider when Preparing for a Respository Neutral ECM. Establish the business requirements as a clear goal for your project and speak to all the departments across all locations and facilities in the organisation to get an indication on how many employees need access. One of my early projects during business requirements discovery the number of employees needing access increased to 115 from an initial 15 and fortunately the architecture scaled easily for the multi-site distribution of employees. Be very clear about what you are trying to solve with each requirement and ensure that each stakeholder has had a chance to provide their list of requirements. At a recent project, it became apparent one of the biggest issues a majority of employees were having was needing information locked in a system they had no access to. This led to either using inaccurate or out of date information, or using inefficient methods to access the information through someone with a license. Management hadn’t provided access because the licenses were considered expensive and weren’t aware of the impact the work around methods were having on the organisation. Prioritise the requirements with your project team and base the order on importance, technical complexity, risk and cost to implement. At a project where we were asked to provide a solution to standardise the handling of proprietary formulas within an organisation, several steps leading up to the conception of these formulas needed to be in place prior to work starting on the actual formulas themselves. Identify all existing locations where information is stored including documents in file shares and file syncing services like Dropbox and OneDrive, databases including financial, service & CRM information and portals. A quick way to get a concise list is to ask finance for details on the software subscriptions and maintenance they pay or have paid in the past. Establish the current and annual volume increase as well as types of information stored e.g Proposals, Invoices, Drawings, Customer Service Tickets etc… Modern ECMs like M-Files utilise compression and binary delta algorithms to efficiently store versions of documents, so your annual volume increase for migrated repositories will be considerably less. The site admin at one of my projects stated that after moving to M-Files where the chance of duplication and multiple versions of files was essentially wiped out, they went from network share storage increasing by 1TB per year to the M-Files vault only increasing by 50GB per year. Determine which of these repositories need to remain in operation and which could be migrated into your ECM and be retired. We usually migrate things like legacy access databases that perform simple tasks like providing unique identifiers (e.g. batch numbers) to the ECM so it then provides the batch number as part of a workflow. You may have situations where it’s critical to preserve a legacy repository like a customer portal that allows service tickets to be raised. Its content can still be made available in the ECM for search capabilities and other purposes while its original functionality is preserved. Review the current levels of security within each repository that that will be accessed via the ECM and map them to one of the scenarios in the table below. The credentials used to access the external repository will be determined by the type of access specified for the connection. As an example, providing public access to Supplier and Customer lists may be necessary for all users in the ECM as this information is useful as metadata for other objects, whereas you may want to limit access to project related data to only the people in the project team. We often provide ‘metadata-driven’ permissions on project based data by including ‘project team’ metadata with the project so security access can be easily managed by the client. Determine if the system will be hosted on-premise, in the cloud or a hybrid to enable planning for hardware, review of service agreements with cloud providers or both. We’ve found to avoid delay in starting projects, development can be done on cloud servers during the process of hardware procurement and deployment, and then transferred once the on-premise environment is ready. It’s also quick and very easy to change cloud server specs to increase performance if needed. Use the current volume plus expected annual volume increase values (from step 2) to determine what sort of backend the ECM requires as well as to establish storage and backup requirements. M-Files recommend using the embedded database option (Firebird) up to 50,000 objects and Microsoft SQL Server once that has been exceeded. If using Microsoft SQL Server, you also have the option of storing the file data within the database or as separate files. There are pros and cons that I’ll go through in another blog. Size the hardware based on the number of employees and volume of data to be stored (from step 2), use the business requirements (from step 1) to help. Identify how connection will be made to each external repository (local or cloud) so connectivity can be determined either directly or whether a VPN is required. Where connectivity is difficult, it may be feasible to maintain a local copy that’s refreshed periodically or use technology that provides these capabilities. Establish the landscape for how employees will access the ECM keeping in mind it will become the central point to reference the connected external repositories. Most ECMs support access through Windows Desktop clients, Web Access and Mobile clients. If the ECM will be available externally, securing access via SSL or VPN is critical. On most of our M-Files deployments, our clients not only want access to M-Files via their mobile phone, but also on their laptops from anywhere! We use their SSL certificate (required for mobile access) and setup what’s called ‘HTTP over RPC’ so their M-Files Desktop Client connects securely whenever an internet connection is present. If you want to know more about setting up HTTP over RPC for M-Files, contact us. 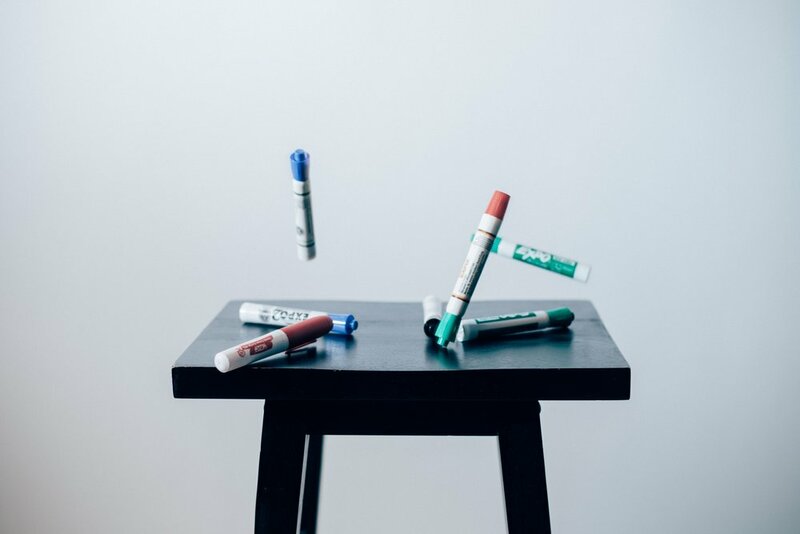 Some ECMs support replication strategies where servers can be hosted in multiple locations and cache or replicate from a central location to provide efficient access to information. We’ve delivered successful projects where M-Files outperformed SharePoint when deployed to a customer’s remote locations as ‘cache’ servers that connect back to the main M-Files server via hardware based VPNs over 3G links. Consideration needs to be given to the technologies available to help meet access requirements.